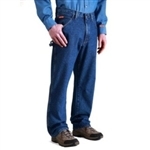 * Flame Resistant carpenter jeans are made of 14.75 oz. 100% denim. * Made with "room2move" relaxed fit, improved seat, thigh, knee and bottom opening, action gusset, extra deep pockets, reinforced back pockets, and over-sized watch pocket. * Available in even and odd size waist, even size length/inseam only 30-36. * NFPA 70E and NFPA 2112 compliant. 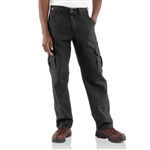 * Flame Resistant original fit jeans are made of 14.75 oz. heavyweight broken twill denim. * Jean have Authentic Five pocket styling, legs are cut to fit over boots. * Most popular Wrangler Jean. * Available in even and odd waist sizes 28-46, even size length/inseam only 30-38. 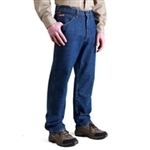 * Flame Resistant relaxed fit jeans are made of 14.75 oz. heavyweight broken twill denim. * Jean have Authentic Five pocket styling, utility pocket, gusset, legs are cut to fit over boots. 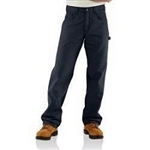 * Flame Resistant relaxed fit-lightweight jeans are made of 12.5 oz. lightweight denim. * Jean have Authentic Five pocket styling, with more comfortable waist, deep front pockets with functional watch pocket, and legs are cut to fit over boots. * This fit is considered more modern with a lower cut waist. * Available in even and odd waist sizes 28-42, even size length/inseam only 30-38. * Flame Resistant carpenter jeans are made of 14.75 oz 100% denim. * Made with "room2move" relaxed fit, improved seat, thigh, knee and bottom opening, action gusset, extra deep pockets, reinforced back pockets, and oversized watch pocket. Get the fashion jean you want at the Wrangler price! 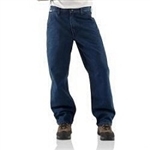 * Flame Resistant extreme relaxed fit jeans are made of 13.75 oz 100% cotton denim. * Back pocket detail. Available in even and odd size waist, even size length/inseam sizes 28-42 with inseam lengths of 30-38. 30-36. * NFPA 70E, HRC 2 and NFPA 2112 compliant. * Made of 10 oz FR 100% cotton denim. 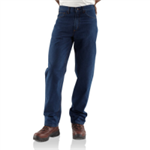 * Flame Resistant relaxed fit jeans are made of 11.75 oz. FR 100% cotton denim. * Relaxed fit sits slightly above the waist, relaxed seat and thigh, with a straight leg opening. * Has two back pockets, double stitched main seams. * Moves With You 4-Way Flex Technology. * Made of 12 oz 94% cotton/5% polyester, 1% spandex, authentic five pocket styling. * ARC-resistant button waistband closures, high quality brass zipper, fits over boots. * Made of 13 oz FR denim, vintage boot cut fit, authentic five pocket styling. * Arc-resistant button waistband closure, brass zipper, fits over boots. * NFPA 70E & NFPA 2112 compliant. Made of 12.5 oz 99% cotton/1% spandex FR Denim, Straight fit, rugged flex durable stretch technology for ease of movement, straight fit sits slightly below the waist, closer to the body fit through seat and thigh with room to move, slim seat and thigh. NFPA 70E and NFPA 2112 compliant. 70% cotton/ 30% modacrylic, authentic five pocket styling, Wicks sweat away from the body, pulling moister to the outside of the garment where it can evaporate quickly. NFPA 70E and NFPA 2112 compliant. * Flame Resistant relaxed fit jeans are made of 11.75 oz. (FR 100% cotton denim). * The have two back pockets, double stitched main seams. * Made of 7 oz advanced comfort, 88$ pima cotton/12% nylon blend twill with an ultrasoft finish. * NFPA 70E, NFPA 2112 . * Extra relaxed through waist and hips, loose through thigh, lower rise. * NFPA 70E & NFPA 2112. * Low rise, fashion boot cut. * Slim through seat & thigh, low rise. * Made of 8.5 ounce FR canvas made of 88% cotton and 12% high-tenacity nylon, HRC 2. * The Loose Original fit sits slightly above the waist, straight leg opening; loose seat and thighs. * There is a cell phone pocket on left leg and multiple utility pocket on right leg. * They have two back pockets, triple-stitch main seams. * These pants are 8.5 oz. FR canvas pants made of 88% cotton and 12% high-tenacity nylon, HRC 2. * The "Loose Original" fit sits slightly above the waist, straight leg opening (loose seat and thighs). * Two large side cargo pockets with pen slots. * Two back pockets, triple-stitch main seams. * FR 12.5 oz stretch denim, 98% cotton, 2% spandex. * Relaxed through waist, hip and thigh, low rise, boot cut, no-rub comfort inseams, anchored belt loops, phone pocket. * The Khaki & Gray color is made of 11 oz canvas that is 88% cotton and 12% nylon. * All colors have hidden iphone pocket, flat hammer loop, multi-tool pocket, layered back pockets and reinforced hem guard. * Designed with low rise fit, relaxed through waist, hip and thigh, fashion boot cut.